Imagine what could happen if we had a really good sets of usable open learning outcomes, across academic subjects, occupations and professions. It would be easy to express and then trace the relationships between any learning outcomes. To start with, it would be easy to find out which higher-level learning outcomes are composed, in a general consensus view, of which lower-level outcomes. Some examples … In academic study, for example around a more complex topic from calculus, perhaps it would be made clear what other mathematics needs to be mastered first (see this recent example which lists, but does not structure). In management, it would be made clear, for instance, what needs to be mastered in order to be able to advise on intellectual property rights. In medicine, to pluck another example out of the air, it would be clarified what the necessary components of competent dementia care are. Imagine this is all done, and each learning outcome or competence definition, at each level, is given a clear and unambiguous identifier. Further, imagine all these identifiers are in HTTP IRI/URI/URL format, as is envisaged for Linked Data and the Semantic Web. Imagine that putting in the URL into your browser leads you straight to results giving information about that learning outcome. And in time it would become possible to trace not just what is composed of what, but other relationships between outcomes: equivalence, similarity, origin, etc. You can turn learning in on itself and use your learning skills to help you learn how to become an increasingly effective learner. Learning to learn is the key to enhancing all the above. When we talk about privacy, we are often talking about the right to privacy. That is something like the right to limit or constrain disclosure of information relating to oneself. I’ve often been puzzled by the concept of privacy, and I think that it helps to think first about self-disclosure. Self-disclosure is something that we would probably all like to control. There’s a lot of literature on self-disclosure in many settings, and it is clearly recognised as important in several ways. I like the concept of self-disclosure, because it is a positive concept, in contrast to the rather negative idea of privacy. Privacy is, as its name suggests, a “privative” concept. Though definitions vary greatly, one common factor is that definitions of privacy tend to be in terms of the absence of something undesirable, rather than directly as the presence of something valuable. Today is the final day of the InLOC project — a European ICT Standardization Work Programme project I have been leading since November 2011. So a good day for an initial review and reflection. I blogged some previous thoughts on InLOC in November 2012 and February this year, and these thoughts are based on some aspects of the project’s final report. InLOC — Integrating Learning Outcomes and Competences — is all about devising a good way of representing and communicating structures of learning outcomes, competence, skills, competencies, etc. that can be defined by framework owners, and used by many kinds of ICT tools, including those supporting: specifying learning outcomes of courses; claiming skills and competences in portfolios; recruitment and specifying job requirements; learning objectives relevant to resources; and possibly many more. We have produced three CEN Workshop Agreements, two formally approved and awaiting publication (Information Model, and Guidelines), and one where a workshop vote will be concluded in the coming days (Application Profile: we don’t expect any problems). Further work includes technical bindings, and two demo prototypes kindly contributed. There are a number of key advances made in the InLOC Information Model, with respect to other and previous work. “LOC” here stands for “Learning Outcome or Competence”. A clear distinction is made between a LOCdefinition and a LOCstructure. A LOCdefinition is similar in some ways to IMS RDCEO or IEEE RCD. Any idea of structure is kept separate from this, so that the definition can potentially be reused in different structures. Thus, a LOC definition is like the expression of just one concept about learning outcome, competence, etc. A LOCstructure is the information about the structure and compound properties, but this is kept separate from any particular single definition. While it is recognised that in practice the two are often mixed, the InLOC specification separates them for clarity and for effective implementation. A clear distinction is made between defining levels with level definitions, and attributing levels (from another scheme) to definitions. This is explained in InLOC treatment of levels. This is necessary for logical clarity, and therefore at some point for applications. A decimal number is introduced as a key part of the model, to allow level information to be automatically processed. A single structural form, the LOCassociation, is used both to represent relationships between LOC structures and definitions, and to represent several different kinds of compound properties, each with more than one part. This results in structures that are easier to process, with fewer distinct information model components. It also is responsible for the relative ease of representing InLOC naturally in RDF, with minor changes to the model. Within InLOC in general, a recurrent pattern is of one identifier together with a set of multilingual titles or labels. This is a common pattern elsewhere, and ensures that InLOC representations can naturally work multilingually. There is a diagrammatic illustration of the Information Model structure as a UML diagram, and many more illustrative diagrams in the Guidelines section on InLOC explained through example. The central feature of the Guidelines is a detailed examination of a cross-section of the European e-Competence Framework, given as a good example of the power and flexibility of InLOC in a case from real life. The e-CF is a useful example for InLOC as it identifies 5 levels of competence. The e-CF is analysed in the section on InLOC explained through example. In this section, there are more diagrams illustrating the Information Model and how it is applied in this case. The e-CF is fully expressed here in InLOC XML format. The most used Europass instrument is the Europass CV, and Cedefop have recently been revamping it. It is a kind of simple e-portfolio, and the challenge here is to allow it to refer effectively to InLOC structures, so that the end users — the people who have the skills and competences they want to show off — can refer directly to InLOC identifiers, and so have better hope of having them accurately recognised and found in relevant searches. For the Europass CV, the InLOC team have proposed a modification of their XML Schema, and it looks like several if not all of our proposals will be taken on by Cedefop, paving the way for the Europass CV being a leading example of the use of InLOC structures in practice. We hope that they are reasonably clear and self-explanatory. While the project found no great motivation for developing other bindings, I personally believe that it would be very valuable in the future to develop something with RDFa and schema.org. We have been really lucky to have two initiatives filling in where the project was not funded to deliver. There is a Viewer-editors page on the project wiki with access details. A team from Eummena, led by one of the team, have produced an InLOC viewer/editor based on PHP and MySQL. Here is their login page. Henk Vos from Rapasso has produced a prototype using Python and Django. The interface starts here. The code is open source, GPL v3, available on GitHub. The main challenge in this project has been trying to generate interest and contributions from interested parties. It’s not that the topic isn’t important, just that, as usual, busy people need a pressing reason to engage with this kind of activity. This challenge is endemic to all “anticipatory” standardization work. Before either policy mandation or clear economic interest, it takes some spare effort and a clear vision before people are willing to engage. I’m intending to write more about what this means for my own personal view of what standardization could best be, or perhaps “should” be. work on APIs, and on automatic configuration of key domain terms within user interfaces. What could a GPS for learner journeys look like? Last weekend, a motley crew of designers, students, developers, business and government people came together in Edinburgh to prototype designs and apps to help learners manage their journeys. With help, I built a prototype that showed how curriculum and course offering data can be combined with e-portfolios to help learners find their way. The first official Scottish government data jam, facilitated by Snook and supported by TechCube, is part of a wider project to help people navigate the various education and employment options in life, particularly post 16. The jam was meant to provide a way to quickly prototype a wide range of ideas around the learner journey theme. While many other teams at the jam built things like a prototype social network, or great visualisations to help guide learners through their options, we decided to use the data that was provided to help see what an infrastructure could look like that supported the apps the others were building. Where is the learner in their journey? Where can we suggest they go next? What can help them get there? Who can help or inspire them? Here’s a slide deck that outlines the results. For those interested in the nuts and bolts read on to learn more about how we got there. To show how you can map where someone is on their learning journey, I made up an e-portfolio. Following an excellent suggestion by Lizzy Brotherstone of the Scottish Government, I nicked a story about ‘Ryan’ from an Education Scotland website on learner journeys. I recorded his journey in a Mahara e-portfolio, because it outputs data in the standard LEAP2a format- I could have used PebblePad as well for the same reason. I then transformed the LEAP2a XML into very rough but usable RDF using a basic stylesheet I made earlier. Why RDF? Because it makes it easy for me to mash up the portfolios with other datasets; other data formats would also work. The made-up curriculum identifiers were added manually to the RDF, but could easily have been taken from the LEAP2a XML with a bit more time. I expected that the Curriculum for Excellence would provide the basic structure to guide Ryan from his school qualifications to a college course. Not so, or at least, not entirely. The Scottish Qualifications Framework gives a good idea of how courses relate in terms of levels (i.e. from basic to a PhD and everything in between), but there’s little to join subjects. After a day of head scratching, I decided to match courses to Ryan’s qualifications by level and comparing the text of titles. We ought to be able to do better than that! The course data set was provided to us was a mixture of course descriptions from the Scottish Qualifications Authority, and actual running courses offered by Scottish colleges all in one CSV file. During the jam, Devon Walshe of TechCube made a very comprehensive data set of all courses that you should check out, but too late for me. I had a brief look at using XCRI feeds like the ones from Adam Smith college too, but went with the original CSV in the end. I tried using LOD Refine to convert the CSV to RDF, but it got stuck on editing the RDF harness for some reason. Fortunately, the main OpenRefine version of the same tool worked its usual magic, and four made-up SQA URIs later, we were in business. This query takes the email of Ryan as a unique identifier, then finds his qualification subjects and level. That’s compared to all courses from the data jam course data set, and whittled down to those courses that match Ryan’s qualifications and are above the level he already has. The result: too many hits, including ones that are in subjects that he’s unlikely to be interested in. So let’s throw in his interests as well. Result: two courses that are ideal for Ryan’s skills, but are a little above his level. So we find out all the sensible courses that can take him to his goal. One other quirk about the curriculum for excellence appears to be that there are subject taxonomies, but they differ per level. Intralect implemented a very nice one that can be used to tag resources up to level 3 (we think). So Intralect’s Janek exported the vocabulary in two CSV files, which I imported in my triple store. He then built a little web service in a few hours that takes the outcome of this query, and returns a list of all relevant resources in the Intralibrary digital repository for stuff that Ryan has already learned, but may want to revisit. It’s always easier to have someone along for the journey, or to ask someone who’s been before you. That’s why I made a second e-portfolio for Paula. Paula is a year older than Ryan, is from a different, but nearby school, and has done the same qualifications. She’s picked the same qualification as a goal that we suggested to Ryan, and has entered it as a goal on her e-portfolio. Ryan can get it touch with her over email. This query takes the course suggested to Ryan, and matches it someone else’s stated academic goal, and reports on what she’s done, what school she’s from, and her contact details. For those parts of the Curriculum for Excellence for which experiences and outcomes have been defined, it’d be very easy to be very precise about progression, future options, and what resources would be particularly helpful for a particular learner at a particular part of the journey. For the crucial post 16 years, this is not really possible in the same way right now, though it’s arguable that its all the more important to have solid guidance at that stage. Some judicious information architecture would make a lot more possible without necessarily changing the syllabus across the board. Just a model that connects subject areas across the levels, and school and college tracks would make more robust learner journey guidance possible. Statements that clarify which course is an absolute pre-requisite for another, and which are suggested as likely or preferable would make it better still. We have the beginnings of a map for learner journeys, but we’re not there yet. Other than that, I think agreed identifiers and data formats for curriculum parts, electronic portfolios or transcripts and course offerings can enable a whole range of powerful apps of the type that others at the data jam built, and more. Thanks to standards, we can do that without having to rely on a single source of truth or a massive system that is a single point of failure. Find out all about the other great hacks on the learner journey data jam website. The wider CETIS community has often appreciated meeting up, with others sharing the same “special interests”, in “SIG” meetings. That kind of meeting took place, including old “Portfolio” SIG participants, on 11th Dec in Nottingham, and many interesting points came up. The people who came to the meeting would not all use the label “portfolio”. We billed the meeting as exploring issues from the viewpoint of the learner, so neither institutions, nor providers of learning resources, were the focus. The e-portfolio community has indeed had the learner at the centre of thinking, but this meeting had many ideas that were not specifically “portfolio”. Indeed, the main attraction of the day was Doug Belshaw talking, and leading a workshop, on the Mozilla Open Badges concept and technology. Badges are not in themselves portfolios, though they do seem to fit well into the same “ecosystem”, which perhaps may come gradually to supplant the current system of the established educational institutions monopolising the award of degrees, with those being necessary for many jobs. And Doug converted people! Several attendees who had not previously been convinced of the value of badges now saw the light. That can only be good. For those with doubts, Doug also announced that the Mozilla team had agreed to introduce a couple more pieces of metadata into the Open Badges specification. That is definitely worth looking at closely, to see if we can use that extra information to fill gaps that have been perceived. One of these new metadata elements looks like it will naturally link to a definition of skill, competence, or similar, in the style of InLOC, which of course I think is an excellent idea! My own contribution was an outline argument of the case that InLOC is positioned to unlock a chain of events, via the vital link of employers taking non-institutional credentials seriously, towards “reinvigorating the e-portfolio landscape”. 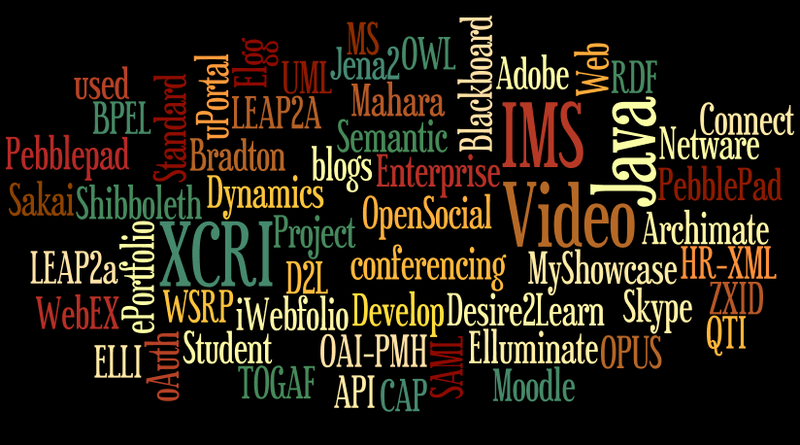 So learner-focused learning technology community is alive and well, and doing many good things. In parallel with the badges workshop, a small group including me talked over more subtle issues. For me, a key point is the need to think through the bigger picture of how badges may be used in practice. How will we differentiate between the likely plethora of badges that will be created and displayed? How will employers, for example, distinguish the ones that are both relevant to their interests, and issued by reputable people or bodies? Looking at the same question another way, what does it take to be the issuer of badges that are genuinely useful, and that will really help the labour market move on? Employers are no more going to wade through scores of badges than they currently wade through the less vital sections of an e-portfolio. We could see a possible key idea here as “badging the badgers”. If we think through what is needed to be responsible for issuing badges that are really useful, we could turn that into a badge. And a very significant badge it would be, too! The local arrangements were ably looked after by the Nottingham CIePD group, which seems to be the most active and highly-regarded current such group in UK HE. Ever since, under Angela Smallwood, Nottingham pioneered the ePARs system, they have consistently been in the forefront of developments in this area of learning technology. I hope that they, as well as other groups, will be able to continue work in this area, and continue to act as focal points for the learner-centric learning technology community. In his fascinating book Strangers to Ourselves, psychologist Timothy Wilson summarizes decades of research [...] showing us just how much of what we do during every moment of every day [...] is happening below our conscious awareness. Some of it we can notice if we engage in a little self-reflection, but much of it we simply cannot — it’s not directly accessible to us at all. JISC commissioned a Leap2A review report (PDF), carried out early in 2012, that has now been published. It is available along with other relevant materials from the e-Portfolio interoperability JISC page. For anyone following the fortunes of Leap2A, it is highly worthwhile reading. Naturally, not all possible questions were answered (or asked), and I’d like to take up some of these, with implications for the future direction of Leap2 more generally. The summary recommendations were as follows — these are very welcome! JISC should continue to engage with vendors in HE who have not yet implemented Leap2A. Engagement should focus on communities of practice that are using or are likely to use e-portfolios, and situations where e-portfolio data transfer is likely to have a strong business case. JISC should continue to support small-scale tightly focused developments that are likely to show immediate impact. JISC should consider the production of case studies from PebblePad and Mahara that demonstrate the business case in favour of Leap2A. JISC should consider the best way of encouraging system vendors to provide seamless import services. JISC should consider constructing a standardisation roadmap via an appropriate BSI or CEN route. That tallies reasonably with the outcome of the meeting back in November last year, where we reckoned that Leap2A needs: more adoption; more evidence of utility; to be taken more into the professional world; good governance; more examples; and for the practitioner community to build around it models of lifelong development that will justify its existence. Established public standards bodies (such as ISO, BSI and CEN), while doing valuable work, have some aspects that would benefit from modernisation to bring them more into line with organisations such as W3C and OASIS. The point then elaborated is that the community really needs open standards that are freely available as well as royalty-free and unencumbered. The de jure standards bodies normally still charge for copies of their standards, as part of their business model, which we see as outdated. If we can circumvent that issue, then BSI and CEN would become more attractive options. It is the previous recommendation, number 5 in the list above, that I will focus on more, though. Here is the fuller version of that recommendation (appearing as paragraph 81). One of the challenges identified in this review is to increase the usability of data exchange with the Leap2A specification, by removing the current necessity for separate export and import. This report RECOMMENDS that JISC considers the best way of encouraging system vendors to provide seamless data exchange services between their products, perhaps based on converging practice in the use of interoperability and discovery technologies (for example future use of RDF). It is recognised that this type of data exchange may require co-ordinated agreement on interoperability approaches across HEIs, FECs and vendors, so that e-portfolio data can be made available through web services, stressing ease of access to the learner community. In an era of increasing quantities of open and linked data, this recommendation seems timely. The current initiatives around courses information — XCRI-CAP, Key Information Sets (KIS) and HEAR — may suggest some suitable technical approaches, even though a large scale and expensive initiative is not recommended in the current financially constrained circumstances. As an ideal, that makes perfect sense from the point of view of an institution transferring a learner’s portfolio information to another institution. However, seamless transfer is inherently limited by the compatibility (or lack of it) between the information stored in each system. There is also a different scenario, that has always been in people’s minds when working on Leap2A. It is that learners themselves may want to be able to download their own information, to keep for use, at an uncertain time in the future, in various ways that are not necessarily predictable by the institutions that have been hosting their information. In any case, the predominant culture in the e-portfolio community is that all the information should be learner-ownable, if not actually learner-owned. This is reflected in the report’s paragraph 22, dealing with current usage from PebblePad. The implication of the Leap2A functionality is that data transfer is a process of several steps under the learner’s control, so the learner has to be well-motivated to carry it out. In addition Leap2A is one of several different import/export possibilities, and it may be less well understood than other options. It should perhaps be stressed here that PebblePad supports extensive data transfer methods other than Leap2A, including zip archives, native PebblePad transfers of whole or partial data between accounts, and similarly full or partial export to HTML. This is followed up in the report’s paragraph 36, part of the “Challenges and Issues” section. There also appears to be a gap in promoting the usefulness of data transfer specifically to students. For example in the Mahara and PebblePad e-portfolios there is an option to export to a Leap2A zip file or to a website/HTML, without any explanation of what Leap2A is or why it might be valuable to export to that format. With a recognisable HTML format as the other option, it is reasonable to assume that students will pick the format that they understand. Similarly it was suggested that students are most likely to export into the default format, which in more than one case is not the Leap2A specification. The obvious way to create a simpler interface for learners is to have just one format for export. What could that format be? It should be noted first that separate files that are attached to or included with a portfolio will always remain separate. The issue is the format of the core data, which in normal Leap2A exports is represented by a file named “leap2a.xml”. It could be plain HTML, but in this case the case for Leap2A would be lost, as there is no easy way for plain HTML to be imported into another portfolio system without a complex and time-consuming process of choosing where each single piece of information should be put in the new system. It could be Leap2A as it is, but the question then would be, would this satisfy users’ needs? Users’ own requirements for the use of exports is not spelled out in the report, and it does not appear to have been systematically investigated anywhere, but it would be reasonable to expect that one use case would be that users want to display the information so that it can be cut and pasted elsewhere. Leap2A supports the display of media files within text, and formatting of text, only through the inclusion of XHTML within the content of entries, in just the same way as Atom does. It is not unreasonable to conclude that limiting exports to plain Leap2A would not fully serve user export needs, and therefore it is and will continue to be unreasonable to expect portfolio systems to limit users to Leap2A export only. If there were a format that fully met the requirements both for ease of viewing and cut-and-paste, and for relatively easy and straightforward importing to another portfolio system (comparable to Leap2A currently), it might then be reasonable to expect portfolio systems to have this as their only export format. Then, users would not have to choose, would not be confused, and the files which they could view easily and fully through a browser on their own computer system would also be able to be imported to another portfolio system to save the same time and effort that is currently saved through the use of Leap2A. So, on to the question, what could that format be? What follows explains just what the options are for this, and how it would work. A microformat (sometimes abbreviated µF) is a web-based approach to semantic markup which seeks to re-use existing HTML/XHTML tags to convey metadata and other attributes in web pages and other contexts that support (X)HTML, such as RSS. This approach allows software to process information intended for end-users (such as contact information, geographic coordinates, calendar events, and the like) automatically. Wikipedia quotes the Schema.org originators (launched on 2 June 2011 by Bing, Google and Yahoo!) as stating that it was launched to “create and support a common set of schemas for structured data markup on web pages”. It provides a hierarchical vocabulary, in some cases drawing on Microformats work, that can be used within the RDFa as well as Microdata formats. Is it possible to represent Leap2A information in this kind of way? Initial exploratory work on Leap2R has suggested that it is indeed possible to identify a set of classes and properties that could be used more or less as they are with RDFa, or could be correlated with the schema.org hierarchy for use with Microdata. However, the solution needs detail adding and working through. In principle, using RDFa or Microdata, any portfolio information could be output as HTML, with the extra information currently represented by Leap2A added into the HTML attributes, which is not directly displayed, and so does not interfere with human reading of the HTML. Thus, this kind of representation could fully serve all the purposes currently served by HTML export of Leap2A. It seems highly likely that practical ways of doing this can be devised that can convey the complete structure currently given by Leap2A. The requirements currently satisfied by Leap2A would be satisfied by this new format, which might perhaps be called “Leap2H5″, for Leap2 information in HTML5, or maybe alternatively “Leap2XR”, for Leap2 information in XHTML+RDFa (in place of Leap2A, meaning Leap2 information in Atom). Thus, in principle it appears perfectly possible to have a single format that simultaneously does the job both of HTML and Leap2A, and so could serve as a plausible principal export and import format, removing that key obstacle identified in paragraph 36 of the Leap2A review report. The practical details may be worked out in due course. There is another clear motivation in using schema.org metadata to mark up portfolio information. If a web page uses schema.org semantics, whether publicly displayed on a portfolio system or on a user’s own site, Google and others state that the major search engines will create rich snippets to appear under the search result, explaining the content of the page. This means, potentially, that portfolio presentations would be more easily recognised by, for instance, employers looking for potential employees. In time, it might also mean that the search process itself was made more accurate. If portfolio systems were to adopt export and import using schema.org in HTML, it could also be used for all display of portfolio information through their systems. This would open the way to effective export of small amounts of portfolio information simply by saving a web page displayed through normal e-portfolio system operation; and could also serve as an even more effective and straightforward method for transferring small amounts of portfolio information between systems. Having recently floated this idea of agreeing Leap2 semantics in schema.org with European collaborators, it looks like gaining substantial support. This opens up yet another very promising possibility: existing European portfolio related formats could be harmonised through this new format, that is not biased towards any of the existing ones — as well as Leap2A, there is the Dutch NTA 2035 (derived from IMS ePortfolio), and also the Europass CV format. (There is more about this strand of unfunded work through MELOI.) All of these are currently expressed using XML, but none have yet grasped the potential of schema.org in HTML through microdata or RDFa. To restate the main point here, this means having the semantics of portfolio information embedded in machine-processable ways, without interfering with the human-readable HTML. I don’t want to be over-optimistic, as currently money tends only to go towards initiatives with a clear business case, but I am hopeful that in the medium term, people will recognise that this is an exciting and powerful potential development. When any development of Leap2 gets funded, I’m suggesting that this is what to go for, and if anyone has spare resource to work on Leap2 in the meanwhile, this is what I recommend. I’ve recently come to the end of working with the team supporting the JISC Lifelong Learning and Workforce Development Programme (LLLWFD) which ran from 1 March 2009 to 31 March 2011 and funded 13 projects. I was involved in this work as part of our programme support of JISC activities, and the main support was provided by the Support Synthesis and Benefits Realisation (SSBR) team, who have been busily collating and digesting all the outputs and findings from the programme. I had the opportunity to provide feedback on draft final reports from the various projects in the programme, which surfaced the issues uncovered in the period of activity. There will be much more coming out of the programme in the next few months (and when it does I will announce it). Several of the projects continued their work in the guise of a Benefits Realisation (BR) project, which basically applies the findings of the initial work and sees if they apply in another, perhaps wider setting or institution. For anyone interested in work based learning, I would encourage you to have a look at these projects and their findings. I’ve provided summaries and links below; the project summaries are derived from the Final Reports from each project, and I have included a focus on the technologies and standards used. 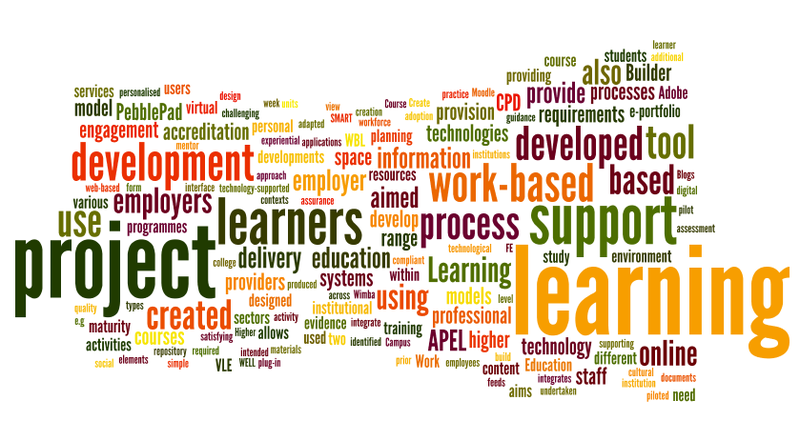 The wordle above is made up from all the project summaries and I think nicely highlights aspects of the programme, with it’s main focus obviously being Lifelong Learning and Work Based Learning, but with some diverse concerns investigated. 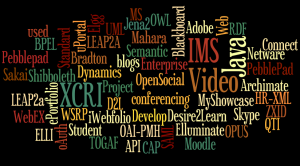 The technologies wordle above shows the technologies and standards used across the Programme. The Programme was not hugely technical in that it did not develop a great deal of new software or applications, but that was never the intention. It is in the deployment and effective use of existing technologies that a richer picture has emerged. The Programme work resulted in many interesting uses of technologies and successful integration of these with work based learners, in addition to exposing common issues that can occur in such initiatives and are more widely applicable, both to other institutions and also for campus based learners. Many projects set out with an initial hypothesis which more often than not was proven. But it is often the journey that project staff and students go along that is the real outcome, and that can be quite difficult to capture. Also pertinent to future work are the things that didn’t go well, or not quite as expected, as is often the case through nobody’s fault. Economic climate, change in personnel, sod’s law; all have an impact. It is really useful (and interesting from my point of view when reading through the reports) to have an honest account of ‘what didn’t work’ – and these are often the pitfalls that others can try to avoid if they know about them. Work based learners are indeed a group of learners that often require a rethink from the traditional norm. But it is a growing market, and one that we need to be geared up for. Naturally, projects set out to correct a genuine need or concern, and some have implemented their developments into standard practice, which is the desired effect as nobody like to see a worthy project run as a pilot and then end. The project aimed to offer an enhanced and expanded service of information about CPD provision from HE and local cultural organisations to the creative/cultural industries – the Liverpool Culture Campus Portal, involving a large number of partners. The project started out with a challenging set of objectives, the main achievement being the development of a portal for the cultural sector to display CPD offerings which can accept automatic feeds which are XCRI-CAP compliant. Lessons have been learned throughout this process about the business process developments to achieve this, together with the necessary developments in technological systems and organising of information. The project created an online resource that supports the development of co- generated higher education courses by universities and employers; using language and terminology which is familiar to employers – and the employees who would be acting as learners – whilst also satisfying the quality assurance requirements of higher education institutions. The Toolkit produced contains four separate elements: Vocabulary Builder; Outcome Builder; Task Builder and Design Builder. These elements combined support the development of courses and allow learners to provide evidence to demonstrate that they have met the learning requirements of the course. The Toolkit developed was far more flexible than was originally conceived and can be adapted for use with other higher education process, such as: accreditation of prior experiential learning (APEL); employer- based training accreditation (EBTA); quality assurance processes (e.g. validation); and general staff development (e.g. the creation of appropriate intended learning outcomes) The tool integrates with PebblePad. This project aimed to integrate systems that support personalised initial/qualifying professional development (IPD) and continuing professional development (CPD), applicable to professional competency frameworks and enabling work-based learners to control and share their digital artefacts. A Moodle plugin (MyShowcase) plug-in was created and piloted in HE and also FE institutions, with interest from various other sectors. It allows users to integrate learning evidence from a range of online sources to showcase for CPD, career planning, and lifelong-learning. Users can bring together Web 2.0 feeds and a range of other digital content to create rich evidence streams of their online content. The ePPSME project provided the HE sector with reusable models and resources for an e-portfolio based pedagogy to address the needs of SME based learners. The project adopted a participative action research approach through a series of design workshops and consecutive pilot study units to develop the use of an e-portfolio tool as a virtual learning environment and personal learning space to introduce and develop the learners’ reflective practice around targeted learning content. Initial study units in the pilot subjects were based around a web-folio structure using three types of blog-based engagement: individual activity responses, group collaborative discussions, personal critical reflections. This approach ensures ease of use by utilising typical IT skills required for activities such as web-browsing and simple word-processing to avoid deterring learners who lack confidence in their IT competencies. a loss across the whole college of 65% of students’ social space, thus creating the need to provide an alternative in the form of a ‘virtual social space’. Also identified was a need to provide bespoke e-learning training opportunities for teachers and to actively engage with known pockets of inactivity with regard to e-learning across the college. Thirdly, to address a need expressed in Focus Groups to establish a ‘Higher Education (HE) identity’ among staff and students within an institution that is predominantly devoted to the delivery of Further Education (FE). The use of a Moodle Virtual Learning Environment (VLE) to build a Higher Education Student Community Site. This innovation was of particular success with the part-time learners who were now able to carry out ‘keeping warm’ and formative assessment activities week to week, and to use the common room area for peer learning activities. The adoption of Mahara, an open source e-portfolio tool to enable learners to build their own personal profiles, form groups and take ownership of their own space. The project exploited the institutional virtual learning environment (VLE, Blackboard) to establish simple models for the development of communities of support and guidance and to manage and administer the programmes; with a significant amount of administration being moved from paper based to online processes. In order to include employers within the institutional intranet and VLE the university’s identity management process was re-engineered to allow selective access to online systems. The project aimed to support employer engagement and workforce planning requirements by providing a tool intended to provide an integrated view of curriculum provision, both in employer based and higher education sectors of UK. This tool allows end users to import documents containing course descriptions from professional providers, employer specific training and HE, and provide a semantic similarity between the documents. The work also investigated defining types of course information required to support employer-led learner route planning and the potential for exchange of this information (using a specification for the eXchange of Course-Related Information or ‘XCRI’) between various providers. This project developed a web-based tool to support staff through the management of an APEL claim. A desk study, staff survey, piloting and numerous formal and informal meetings led to the creation of the PINEAPPLE core builder which can be used to design and deliver an online APEL process for any institution. The project also produced a range of support materials that can be adapted for use in other contexts. Improved the effectiveness of postgraduate student placements as a means of HE engaging with new employers supported by technology, including web services. Validated the technology developed with not one but two different eportfolio systems and demonstrated the savings that can be achieved through shared services, developing lightweight applications and integrations of existing applications or services. The SMART project was designed to support mentors to overcome some of the difficulties they face in assisting work-based students who are severely ‘time-pressured’, by providing a specifically designed, accessible and supporting interface for inexperienced users of technology. Further aims were to develop the mentor’s role and improve learner engagement while promoting inclusion and collaboration. The research included reference to a selection of ‘Use Case’ scenarios. These involved the interface of mentors with technological modalities for enhancing provision delivery as used within two challenging work-based education programmes currently offered. SMART incorporated various advanced technologies (Podcasts, Vodcasts, Blogs, Game environments, On-line tasks) in an innovative learning environment and assessed the impact on mentor engagement and mentor use of technology-enhanced Learning. The project aimed to identify sustainable models for technology-supported delivery of workforce development provision, and associated strategy and policy implications via developmental activity undertaken in different contexts. Two different work-based learning processes, Learning in Work, and Learning through Work were identified, as were transferable models of technology-supported delivery. Case studied were created to capture the experience of work based learners and use of technologies. Several good practice and additional ‘how to’ guides were created covering technologies such as Adobe Connect, Adobe Presenter, Luminosity, PebblePad, Wimba Create, Wikis and Blogs. A Work-Based Learning Mentoring Handbook was also developed alongside repositories with other useful resources. The e-portfolios were developed using the Blackboard Campus Pack plug-in XPO-XL. The solutions developed are embedded in the participating programme areas and the process of stimulating additional impact through wider adoption is in progress. 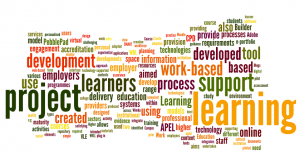 The Project has developed technology enabled resources and tools to support work-based learning, working closely with employers and learning providers to develop a learning framework that allows learners to gain accreditation of both certificated and experiential prior learning (APEL and APCL). The underlying framework and support processes can act as a template for other schools and industry sectors. The project used PebblePad software with work-based learners, with PebblePad Webfolios to support the APEL process and negotiated learning at module level. A level/credit estimator tool assists with admissions and a mapping tool to match employer courses to credit/level has also been developed. A web-based portal for work-based learning provides information and guidance on work-based learning for employers, employees and academics. Customisable Open Educational Resources have been created and released through the JORUM repository and project repository. Course materials created are all SCORM compliant and packaged using Wimba Create (formerly Course Genie) with mini lectures created using Adobe Presenter. The WELL project designed, piloted, and evaluated a model for work-based learning (WBL) module/unit delivery and assessment which integrates technologies to support personalised learning whilst satisfying University accreditation and progression requirements. The model aims to aid sustainability of WBL courses, supporting continuous improvement by revealing key barriers and enablers in a programme’s learning and teaching process. The team’s ‘Benefits Realisation’ project extends the WELL model by providing a model for HE providers to assess their maturity in embedding Work Based Learning programmes. Working at institutional, faculty and programme levels it includes a range of maturity criteria, level statements and indicators for assessing WBL maturity. The Festival of Assemblies brought together projects from the JISC Lifelong Learning and Workforce Development programme (LLLWFD) and was very efficiently organised by the Support Synthesis and Benefits Realisation project for the programme. Activities included parallel sessions of collaborative Assembly sessions led by LLLWFD – Phase 3 and Benefits Realisation or ‘BR’ projects, which basically take forward the work of the projects in the programme and see if the lessons learnt/tools developed can apply in other institutions or organiational contexts. I chose to attend the TELSTAR & PINEAPPLE: Development of APL systems session which included information about the projects and their findings to date followed by some very interesting discussions and anecdotal evidence from various institutions about the actual application of accreditation of prior learning (APL) and the sheer bureaucracy in some quarters which has led students to scrap the idea and just follow the ‘normal’ route. Concerns over parity were raised in particular about the detail and focus on APL processes when compared to traditional learning/ non APL route. An interesting analogy to this was made re the introduction of VLEs and online learning aspects within universities, often any course with an ‘e-learning’ aspect would have to go through a whole separate validation process, maybe with much more scrutiny that face to face teaching. That seems to have settled down, or just become the norm and people know which boxes to tick now, so perhaps the APL teething niggles may turn out to be the same? Nonetheless, with the much discussed ‘current climate’, raise in fees etc, APL will be a key focus and one we have to get right. Potential learners will become savvy (and rightly so) about choices, duration of courses, accreditation and qualification and institutions need to be ready for that and make the whole process as painless as possible for everyone. It looks promising that such projects in the programme will come up with some important lessons for the sector and tips to take forward.